Quest Apartment Hotels has commenced construction on the $25m development of Quest Dandenong Central, part of Australia’s second largest renewal project – the $290m Revitalising Central Dandenong initiative. Being delivered by Places Victoria in partnership with the City of Greater Dandenong, government agencies and the private sector, the initiative was announced in 2006 with a 15-20 year development timeframe in which to rejuvenate the city centre and re-establish Dandenong as the capital of Melbourne’s southeast. State Member for Dandenong Gabrielle Williams MP and Quest CEO Zed Sanjana were onsite yesterday to inspect the progress of construction, joined by Pellicano Managing Director Nando Pellicano and representatives from Places Victoria and the Greater Dandenong City Council. 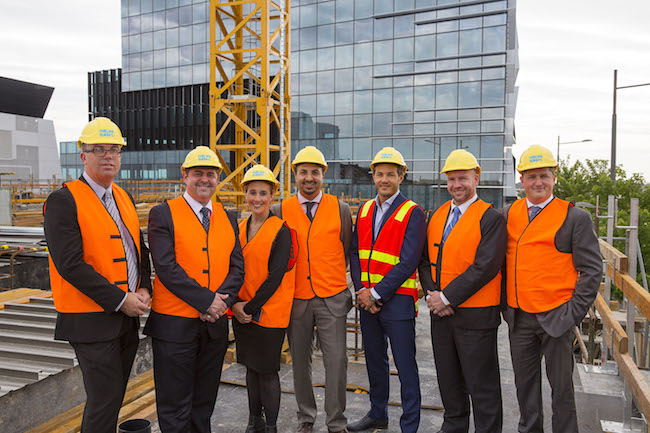 “We are thrilled with how quickly construction is progressing on Quest Dandenong Central - Quest’s 54th property in its home state of Victoria and second in Dandenong,” said Mr Sanjana. “It is fantastic to have the opportunity to be involved with Places Victoria’s Revitalising Central Dandenong initiative – this is a landmark project that will position Dandenong among the country’s leading economic centres. Dandenong is approximately 30km southeast of Melbourne’s CBD and is a central hub of commercial and industrial activity, producing almost half of Victoria’s manufacturing output. The revitalisation initiative is anticipated to generate 5,000 new jobs over the next two decades. Key economic drivers include the public sector, manufacturing, health and research, rental, hiring and real estate. Major features of the local area include the Dandenong Hospital, Plaza, Market and Magistrates Court. Gabrielle Williams MP applauded the new development, stating: "Business tourism and investment are key to the growth and rejuvenation of Dandenong. This development by Quest Apartment Hotels is another significant step in the continued improvement of Central Dandenong. "Quest has a robust relationship with the Pellicano Group, having previously partnered to deliver Quest Woolloongabba (QLD), Quest Glen Waverley (VIC) and Quest Moorabbin (VIC). Quest continues to partner with prestigious and respected development partners to deliver the highest standard of premium accommodation. “We are very excited about this development and are very happy to be working together with Quest again. This property will be retained within our property portfolio, as is Quest Woolloongabba and Quest Moorabbin. On completion, it will take our ownership to over 240 Quest apartments across three properties,” said Mr Pellicano. Quest Dandenong Central will feature 95 apartments comprising studio, one, two and three bedroom configurations. The development will also include onsite parking, a conference room and gymnasium. Located at 2-10 Walker Street, the property is expected to open in August 2016. Guests of Quest Dandenong central will have easy access to public transport and a culturally diverse range of restaurants and cafes. Dandenong’s revitalisation project is forecast to attract $1.2b of private investment, which will see the quantity and quality of amenities in the local area continue to grow.